Would you truly like to know the real story behind “Alzheimer’s Illustrated: From Heartbreak to Hope,” the AAQI’s second traveling quilt exhibit? AAQI's second traveling exhibit has just now come back from the AQS Show in Knoxville and will be on its way to Quilt Expo in Madison, Wisconsin in September. The Alzheimer’s Art Quilt Initiative is thrifty, to say the least. It conceived of and mounted a traveling exhibit of 236 quilts valued at $97,000 and pulled it off with a lot of elbow grease and about $500. That’s a pretty good return on investment! "First off, all the quilts were donated. Since we are all volunteers, all the labor was donated. Most of the supplies were donated. The cord is brought together above the quilt to raise it slightly. What’s holding it there? A single link from a length of metal chain. Why didn’t we just make the cord shorter? Then it wouldn’t wrap around the OUTSIDE perimeter of the mounting for shipment. What did we do with 16 packages of Styrofoam pipe insulation? The original plan was to wrap each of the 182 Name Quilts around a 7″ length. It would only have taken 47 hours to pack up the show. Instead we bundled 8 lengths together, covered them with black fabric, and made “bolsters” to wrap 10 of the long narrow quilts around. Looks like a giant roll of funereal toilet paper. Keeps the quilts from wrinkling. The corrugated plastic signs with information about the quilts for this exhibit were mostly recycled from the last exhibit. We cut them down and stuck the signs on the other side. Each of the 182 Name Quilts has part of a wooden yardstick in a rod pocket at the bottom of the quilt to weigh it down and keep it straight when it hangs. And each one is numbered. The entire exhibit packs into six Rubbermaid totes and weighs about 200 pounds, totes and all. 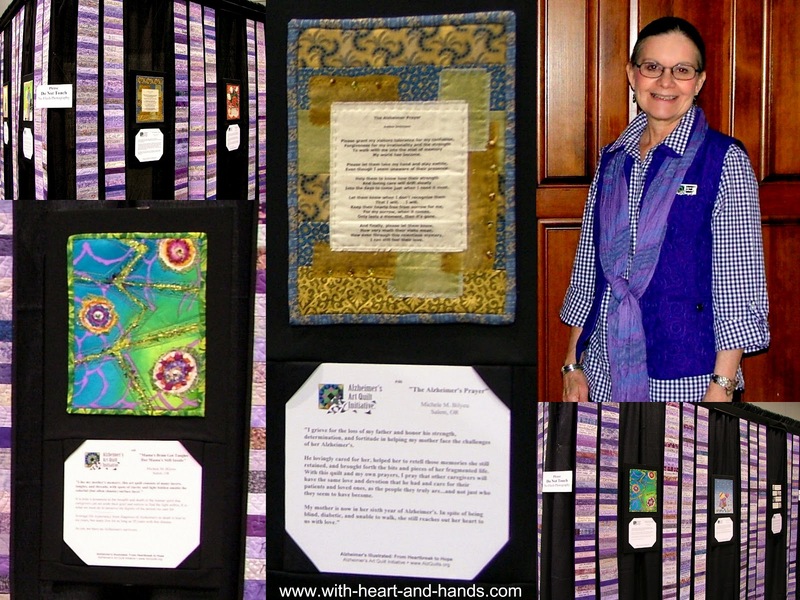 Michele Bilyeu Quilts With Heart and Hands for the Alzheimer's Art Quilt Initiative (AAQI) and has quilts in the Heartbreak to Hope traveling exhibit, on the sales page and often up at auction. 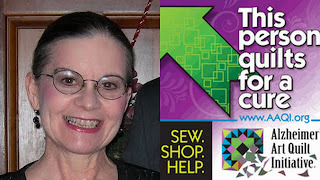 Join in my AAQI Liberated Quilting Challenge...let's all liberate ourselves from this horrible disease! Donate or buy a quilt. today! Debi is right, this is amazing. Who knew?? ?